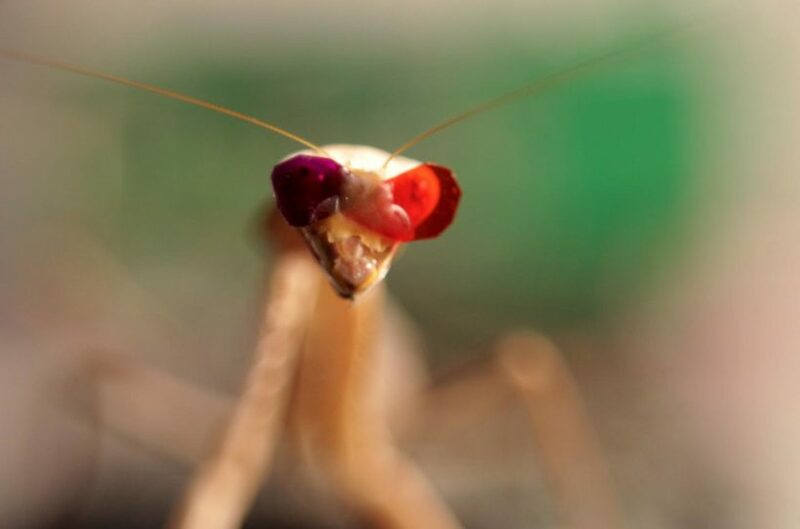 A praying mantis wears the tiny 3-D glasses. The new research could help robots interpret the world around them. (By Katherine Hignett, Newsweek, 2/9/18) – Scientists have used a tiny pair of 3-D glasses to discover exactly how the praying mantis sees the world. For the first time, they have compared mantis vision to that of humans and found the bug interprets three dimensions in a completely different way. The simple way the mantis sees could one day help small robots’ perception by streamlining intensive computer algorithms. The research was published Thursday in Current Biology. In a video released alongside the research (see below), Jenny Read, study author and professor of vision science at Newcastle University, in the U.K., describes how human vision works: Each human eye captures a slightly different picture of the world in front of us, creating a three-dimensional whole. Other animals like monkeys, cats and toads can also see the world in 3-D, and the praying mantis is the only insect known to be capable of this “stereo vision.” But the researchers then investigated whether praying mantises compute 3-D images in a similar way to humans, and discovered significant differences. The team built tiny 3-D glasses to fit the bugs and sat them in a mini–movie theater. 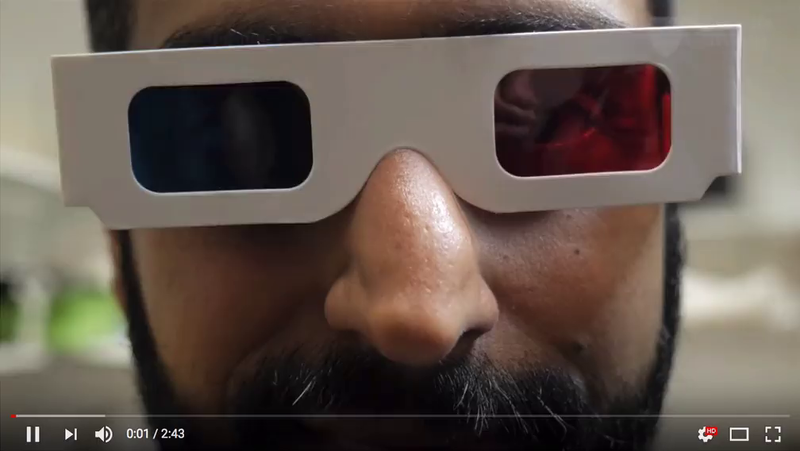 Study author and behavioral ecologist Vivek Nityananda said in the video: “In our insect 3-D cinema, we could show the mantis tasty prey apparently hovering right in front of the mantis.” Convinced, he said, the bug grabs at the fake prey. Next, the critters were shown much more complex stimuli—multicolored moving dot patterns, which are used to examine human 3-D vision. Humans can recognize 3-D perspective easily in still images. The mantises, however, focused on movement. When shown two completely different images for each eye, the insects could match up areas that were changing in both. This is something humans can’t always do. The simplicity of the mantis’s vision makes it an attractive model for vision in robotics, the scientists say. The stereo algorithms needed to interpret a 3-D world can guzzle computing power. A model based on the praying mantis’s vision could eventually help smaller robots like delivery drones detect depth. (AP, Feb. 10, 2018) PYEONGCHANG, South Korea — An army of high-flying drones expected to light up the sky at the opening ceremony of the Olympics was grounded. 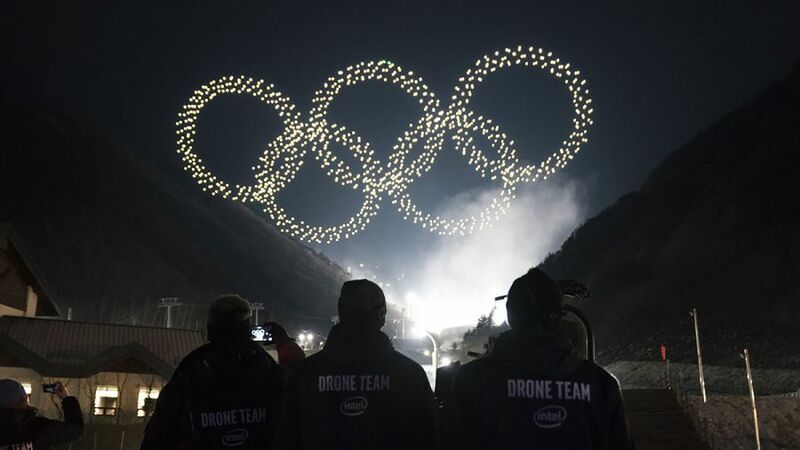 NBC aired a light show, but it was from Intel’s launching of 1,280 drones in December in Pyeongchang. Intel celebrated breaking a Guinness World Record for the most drones flown simultaneously by tweeting a link to the video. The incident was reminiscent of the Sochi Games in 2014, when one of the five Olympic rings failed to light — but Russian state television aired rehearsal footage of it happening.